Free Pattern-“Feel the Love” Valentine Wall Hanging! All the hearts and valentine projects I have been seeing here in the blogosphere inspired me to come up with a quick project that I could get done this weekend. I came up with this free pattern for a Valentine Wall Hanging called “Feel the Love”. Here is a quick tutorial! Fabric needed: a layer cake or (10-12) 10″ squares and 1/2 yd of background fabric. I used a layer cake of Twice as Nice by The Quilted Fish for Riley Blake Designs. It is just full of reds and pinks…I set aside the blues for another project. There were 6 reds and 6 pinks in this layer cake. You only need 10, so pick your favorites. I just used all 12 for a little more variety, but I did have some extras afterwards. Cut into 1.5″ strips. Toss the teeny bits left over. Sew your strips into strip sets of 6 each. Make sure to mix up your strips and press as you go. You will need 10 strip sets. Cut a 3.5″ strip and set aside, we are not using this portion. Using a 4.5″ square ruler as your template…center the 45 degree line along the center seam of your strip set. Trim along all four sides of your ruler. This is what you should end up with. If you don’t have a 4.5″ ruler, you can use a larger one, but will have to do some rotating. Now, this is just the way I did this…so no judging:) Take 4 of your blocks and using your seam ripper, rip out the center seam. Yes, I know….voluntary ripping! Using your background fabric, cut (4) 5″squares and (2) 4.5″ squares. Take one of the half blocks that you just separated and line the corner of the block up with the corner of a 5″ background square. Sew a 1/4″ seam along the edge of the half block, this will be along the same line of stitches you just ripped out. Line your stitching up with the 1/4″ line on your ruler and trim the excess. Use the background piece you just trimmed off and repeat for the other half of your block. Press the new block open for your pieced HST. You should have 8 of these HST blocks, 6 whole blocks and 2 solid background squares for your layout. All of these blocks finish at 4.5″. Cut (2) 4.5″ WOF strips for your borders. Out of one strip sub-cut your right and left borders at 16.5″. Using the other strip sub-cut the top and bottom borders at 24.5″. Add them to your top in that order. Your top is done! Layer up your quilt sandwich and quilt as desired. You will need (2) 2.5″ strips to make your binding. I quilted “Feel the Love” using Aurifil 50wt. cotton thread in Light Gray with a basic straight line quilting design. I finished the binding using this machine binding tutorial. Just a few more days till the New Year begins and I just want to thank everyone who has visited The Sassy Quilter and made my year the best one yet! These were leftover HST’s from a chevron quilt(below) that I made earlier this year. You can see in the pic above I have several quilt tops hanging around my sewing room that seriously need to be quilted…2014 for those. I will be happy if I can at least finish up these quilt tops for now! Here is another I finished up….my Virtual Quilting Bee quilt top! Finally got those borders on there. To wrap up the year and the Millstone Mondays giveaway series we have a 50wt., 10 piece set from Aurifil and a charm pack from Millstone Quilts. Congratualtions to QuiltinGram, last weeks winner! Lario by 3 Sisters charm pack and Aurifil thread collection Autumn by Sheena Norquay. Just leave a comment…..tell me something quilty you would like to accomplish in the New Year! Feel free to share this post on Facebook or if you have your own blog using the Millstone Mondays button on the right sidebar. Spread the quilty love! Contest ends Sunday@12pm and is open internationally. Hope everyone had a great weekend, the countdown is on! Take a deep breath and try to remember to enjoy the holidays….I think I’m talking to myself here:) Yesterday was my B-day, but I did manage to squeeze in some shopping time. Oh, and I got this yummy Waterfront Park by Violet Craft for Michael Miller in a layer cake! Can’t wait to cut into it. A five piece Aurifil thread set and a Jubilee charm pack by Bunny Hill! These light, icy tones have a wintry feel to me and the thread set includes a sample of Aurifil’s different products perfect for testing out and finding what you like best. Do you like a surprise for Christmas or are you the sneaky type, always trying to figure out what you are getting! Me….I like to wait and let it be a surprise when I open it! Feel free to share this post on Facebook or if you have your own blog use the Millstone Mondays button on the right sidebar. Spread the quilty love! Congratulations to Anne J., last weeks winner! You can find and follow TheSassyQuilter on Facebook, Pinterest, Bloglovin’, or by email(on sidebar)! Quilting Thread – My latest discovery! Not all that long ago I won a spool of Aurifil thread(50wt. cotton), and believe it or not, I had never tried this brand before! I had definitely heard of so many quilters using it, but was already using the more expensive brand at Joann’s and to spend a little more seemed too much. But…..I have to say they have definitely won me over! What I used before was better that the cheap stuff, which broke often and filled my machine with lint, but I have to say I am loving Aurifil! Most shops sell the larger spool for around $9-$10, so it seems like a lot more, but there is 1422 yards on there and mine seemed to last forever! Especially the 50wt., it’s finer thread and P.S. makes your bobbin last a lot longer. I love this for my piecing and quilting. For your quilting this means less bold stitches (blends well), which is good for the beginner who may not want all of their stitches to stand out. I could definitely notice the sheen and color of the thread was richer and brighter than what I was using. Even in just a basic grey, smooth and beautiful stitches. I love that they sell collections of threads that match the designers fabric collections! I know, I know… you are thinking, that is a lot of thread for one designers line of fabric! But don’t forget a lot of designers(MODA) are locked into a color way, so this will go with most all their lines. Since I am a new Aurifil convert I bought a Mark Lipinski Basics Collection to get me started, this has all your white, black, grey and biege neutrals. I am drooling over the Simplify collection by Camille Roskelley! You can find this one over at Cotton Bliss! Small kit, $33.80 and the large kit, $80.00 and that’s 12 spools! Oooh, I just need to touch it! I think my fabric addiction is spreading to thread, yikes! 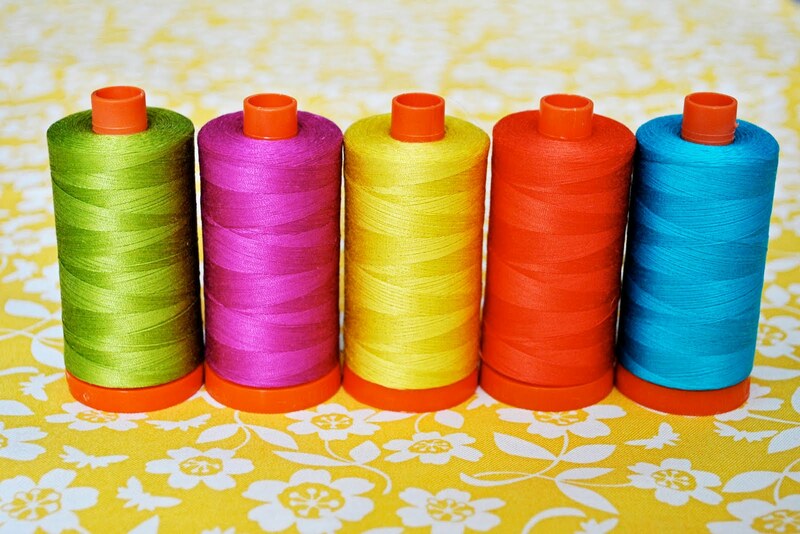 You can find 3 Things every Quilter should know about Thread here. I know there are other good ones out there too folks, just sharing my latest quilty experiences her. In case you were wondering no one paid me to say any of this either, but I can be bribed with thread….just kidding….but not really;) I hope someone new will give it a try and let me know what you think! First of all let me say Thank You so much to everyone who helped me out and voted for my quilt over at 13 Spools in the Prism linky contest!!! Got any awesome quilt plans for the weekend? Well, I am going home tonight to work on a fall/pumpkin-y table runner for a silent auction…and by work on I mean start:) In all fairness I have made a pile of orange fabrics! I have a few ideas and I am hoping they come out as planned…trying to make my pumpkins sassy! I also got my FQ bundle of Acacia from I don’t do dishes! Ah, so lovely…but I must wait. I need to finish quilting my chevron first! Here are some pics. Love the more geometric prints. Is this raccoon making you feel uncomfortable??? These spools are not cheap but I have to say they last a long time, a lot more on there! Feel free to visit on FB here, and give them a like!